To Alibaba, this investment is about its New Retail plan. Hi there! This is an AI-translated article produced by KrASIA’s parent company, 36Kr. 36Kr is China’s leading tech and business media and delivers a gargantuan amount of exclusive news on Chinese startups. KrASIA wants to share these articles first-hand by translating these information swiftly with AI and very minimal human effort. Please understand that the translation may affect your reading experience. Nonetheless, feel free to contact us ([email protected]) should you have any feedback. To Chinese readers, if you’d like to read the original article in Chinese: click here. Home renovation platform “007 eService” raised USD25 million Series C from Alibaba. After this round of financing, 007 will expand its operations across the country, provide more comprehensive offline services, and cooperate with Alibaba in their plans on new retail, having their platform and services on TMall. According to the statistics of China Business Research Institute, the home furniture industry has a market size of about 4.6 trillion RMB with constant growth. Among them, the products are sold to e-commerce and dealers, or the services are missing, or the efficiency is low, the pain points are obvious, and the demand for local maintenance, maintenance and overall renovation of second-hand houses is greatly increased. The market potential after home decoration is huge, and the supply of the post-service market is scattered. Integrate space. Shenong 007 was established in 2014, and platform workers can provide home services related to home life, covering installation, repair, replacement, cleaning, renovation and so on. Shengong 007 is mainly profitable through installation and maintenance service price difference, auxiliary parts spare parts profit and pre-storage storage service fee. At present, there are 50,000 registered workers on the platform, one-tenth of which are active workers (sending orders on the platform for three consecutive months), with an average of 1-3 million orders per month. In 2017, transactions increased by more than 30%. Up to now, it has experienced three stages of development: building a platform – refined operation – the operation center is landing. A platform to build, to undertake the installation orders of e-commerce and building materials home manufacturers / brands, to attract blue-collar workers registration certification, to solve the offline installation problems of e-commerce and manufacturers / brands. Second, the refined operation, pay more attention to user experience and efficiency, improve management efficiency through data means, polish installation and maintenance processes, develop standardized service processes, and set up the Engineering College to train active workers. The three operation centers landed, and the online and offline linkages. Landing regional operation center, to achieve high-quality workers training, service skills training, customer service, order control, worker management and complaints handling; at the same time explore the service of new retail – “Tmall worry-free purchase” life service store, to achieve online and offline Data access, warehouse delivery and integration. So what is “Tmall worry-free purchase”? Why does Shenong 007 layout new retail? Ke Baihua, founder and CEO of Shenong 007, said that Shenong 007 will launch a deep corporate with Tmall’s worry-free purchase, providing consumers with one-stop service + life-changing solutions for new products. Among them, “Tmall worry-free purchase” life service store is the offline entry of Shengong 007 to provide home services, and provides sales of related products, while the store can provide door-to-door service as a front warehouse. In addition to the store experience purchase, in the future, users can also book home service through mobile phone Taobao or mobile Tmall APP. The Beijing Standard Store is now in trial operation and will expand in the form of direct sales + joint ventures. It has now reserved nearly 50 regional managers. At present, Shenong 007 60% of orders from Tmall, in the future, “Tmall worry-free purchase” will also undertake the installation and maintenance needs of community properties, offline channels to obtain customers and improve penetration. The trend is: First, the heavy combination of e-commerce + service is a general trend, while the retail and service of home building materials are still concentrated online (about 85%), which is bound to require the platform to go offline and seize a larger market. win-win Choice: In addition to the experience/retail needs of e-commerce products, e-commerce and dealers have a strong demand for increased offline penetration, while Shengong 007 has workers (service support), supply chain, operation center, and can serve customers at B. At the same time achieve new revenue growth. Why is Shenong 007 able to get Ali’s investment? according toZhiyan Consulting DataIn 2017, the proportion of online shopping in total social retail sales was 19.9%. While building materials and homes are subject to bottleneck restrictions, e-commerce penetration is very limited, home care accounts for about 11%, and furniture is lower. 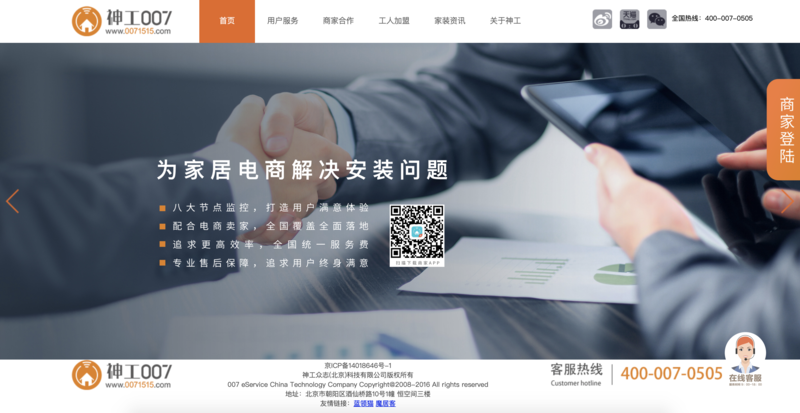 In terms of investment logic, first of all, Shenong 007 provides the after-sales installation service of building materials and household products and the online and offline transactions closed loop, which is in line with Ali’s new retail layout from online to offline to open data and improve penetration. Secondly, in addition to the scale that the platform has accumulated, Ke Baihua believes that focus in the service industry is personnel management efficiency. Shenong 007 has done a lot of work in worker management, including the formulation of management measures and the application of information technology. 1) All workers on the platform must carry out real-name certification before taking orders, and purchase accident insurance and property insurance. The platform will provide workers with business and service training. In the future, Shengong 007 plans to directly sign high-quality workers in focus city to form a strong management relationship to guarantee service quality. 2) The platform sets up seven early warning systems from the worker’s order to the completion of the order, and the early warning starts the customer service will be involved; and the regional management personnel can grasp the status and score of the workers in real time; and introduce the evaluation feedback system. Return visits and research on unsatisfactory evaluations. After this round of financing, Shengong 007 provides a new way of thinking for the development of the blue-collar platform after the home improvement, and with the platform that also serves the field of home life.Easy to get home、wrenchWaiting for a different development path.